Bible Land Tour led by Ferrell Jenkins - March 28 - April 8, 2016.
and Reservation Form may be downloaded in PDF here. Helpful Travel Links are here. A Statement About Security Problems in Israel is here. 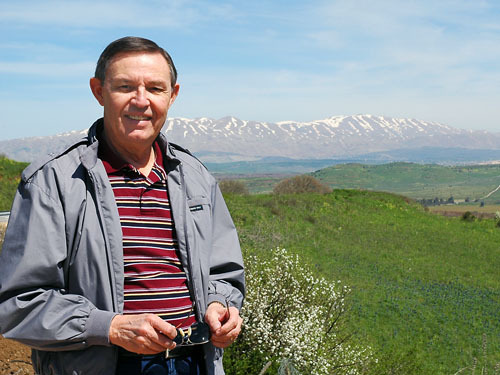 If you've been waiting for a great tour to the Bible Lands, with experienced leadership, you don't have to wait any longer. Our previous tours since 1967 have taken us to almost every area of Bible activity. Altogether this will be our 84th foreign tour, and we have spent much additional time in Israel on personal study tours. We spent 10 days traveling in Israel during May, 2015. This travel experience and acquaintance with Bible lands will do much to make this trip the "trip of a lifetime" for you. The tour is planned to my specifications. We have our own guides and coaches and the tour is under my personal direction throughout. We plan to visit Israel where so many of the exciting Biblical events took place. Your Bible reading will take on new significance as you study what you learn on this tour. Joppa. Joppa is where Jonah took a boat for Tarshish. Cedars from Lebanon were brought to Joppa then taken up to Jerusalem for the Temple. Peter saw a roof-top vision that taught him to go preach to the Gentiles. Mt. Carmel. Ascend beautiful Mt. Carmel to Murakah, the site associated with Elijah and the prophets of Baal. From here you will have a view of the Jezreel Valley. Sea of Galilee Area. Because there is so much to see we will be spending two full days in this area. All points of interest around the Sea of Galilee including sites for feeding of 5,000, the Sermon on the Mount, Capernaum, Bethsaida, Chorazin, and Magdala. 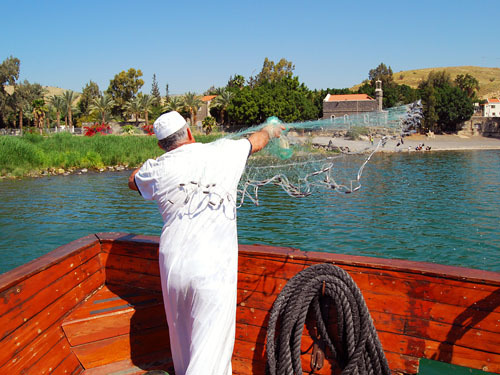 Enjoy a boat ride on the sea as the geographical areas and Biblical sites are pointed out. Northern Galilee. 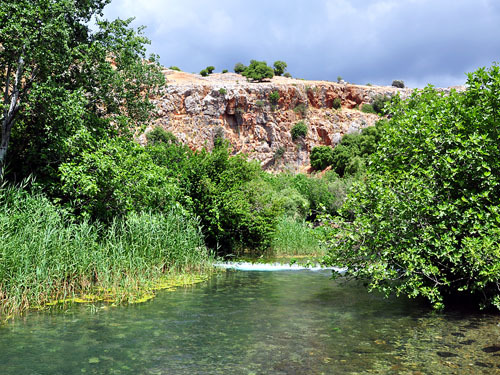 See the Jordan River, Hazor, Dan, and Banias (ancient Caesarea Philippi), Golan Heights. View of the Banias (or Hermon) Stream at the source. The Banias is a major source of the Jordan River. This is the site of Caesarea Philippi. Samaria Region. If conditions permit we will visit Samaria, Jacob's Well, and other sites in the West Bank. in the Bible lands. Mount Hermon in the background. Judea. Visit the Mount of Olives, Wilderness of Judea, Jericho, and Qumran where the Dead Sea Scrolls were found. See the Jordan River at the traditional place where John baptized Jesus, Dead Sea, Ein Gedi and Masada. Jerusalem. 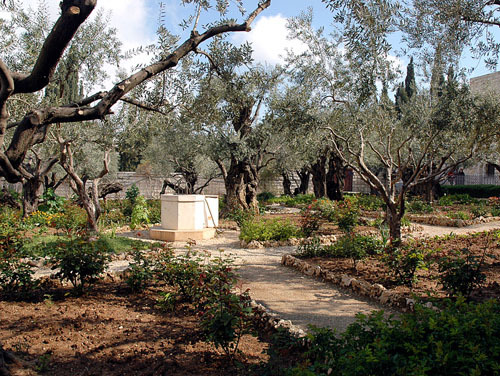 Visits include the Garden Tomb at Gordon's Calvary  the Place of the Skull, Garden of Gethsemane, Valley of Jehoshaphat, Kidron Valley, Mount Zion, the Palace of Caiaphas. Walk through the Old City. Visit Gihon Spring and the Pool of Siloam. Visit the Temple area, Mount Moriah, Western Wall, Via Dolorosa and Church of the Holy Sepulchre. A walk through the market area of the city is an unbelievable experience. See the model of Jerusalem from the time of Christ (now located on the grounds of the Israel Museum), the Shrine of the Book and the Dead Sea Scrolls. We will see some of the most significant archaeological finds from Israel in the Israel Museum. 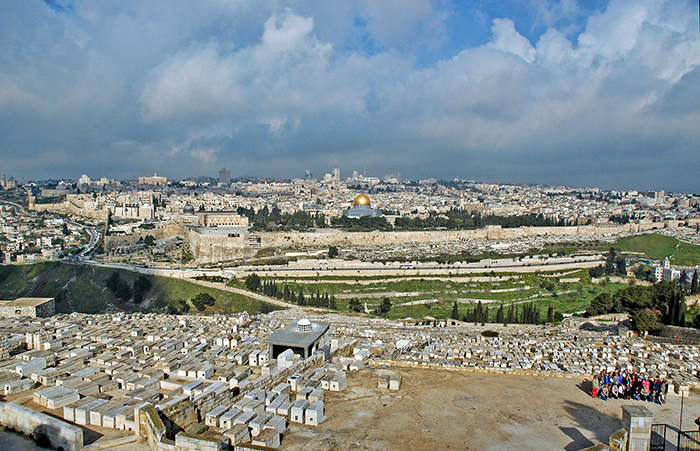 The new archaeological discoveries in the Old City help to make many Bible events come to life. Bethlehem. See the Church of Nativity and Shepherd's fields. We usually provide an opportunity to shop for local souvenirs in Bethlehem. The Shephelah (lowland). 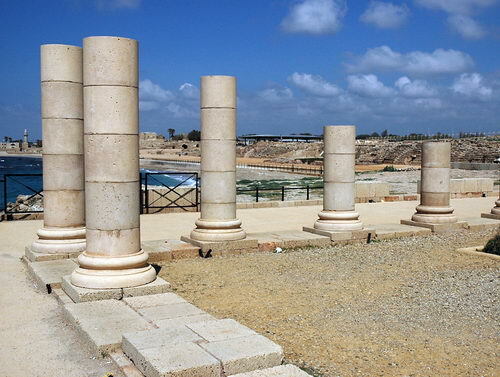 The Shephelah played an important role in the history of Israel. On our final day we take a leisurely drive through this area to see the Valley of Elah, Azekah, Socoh, Gath, Marisha, Lachish, and other significant places of the region. Those who have traveled with us know that we always have some pleasant suprises awaiting the group. Our Bible Lands Tour of Israel includes air transportation from New York, superior first class hotels, buffet breakfast and dinner daily, private motor coach, comprehensive sightseeing with English speaking guides, admissions, porterage, etc. We provide a comprehensive Bible Land Guide with biblical, historical, and archaeological information about the places we visit. We provide our Helpful Hints for Travelers to help you plan for the tour, and we keep you updated with informational bulletins by Email. We are able to offer this excellent tour, including fees and tips, for $4400.00 per person  based on double occupancy and 21 or more tour members. The tour cost is $3525. Airport taxes, airline-imposed surcharges, U.S. departure tax, Israel departure fees, and any other applicable fees amount to $725. (These fees are beyond our control and are always subject to change.) We will also collect $150 from each tour member for tips. Tips are distributed by the tour leader to guides, drivers, waiters, and other hotel personnel. The Israeli visa is obtained on arrival at the Tel Aviv airport. It is free at this time. Single supplement for an individual desiring a single room is $860 (based on availability). A deposit of $500.00 (per person) will reserve a place for you. This is a high quality tour. Early reservation is a must! The final payment is due by December 21, 2015. We do not accept credit cards. Currently, tourism is booming year round in Israel. As a result the costs are rising each year. Our tour includes numerous extras that require additional entry fees. We don't think you ought to travel that far and miss seeing something of real significance because it has an admission fee of $5 to $25 dollars. I have directed many tours in March and April. Typically, there might be some rain, but not much. The country is filled with green after the winter rains, and flowers are blooming. Israel is a small country, but the terrain is diverse. This makes it difficult to explain the weather one faces on this tour. We spend one night along the Mediterranen Coast at Netanya, three nights in Tiberias, and five nights in Jerusalem. The temperature at Tiberias is warm because the elevation is almost 700 feet below sea level. Jerusalem is situated in the central mountain range at an elevation of about 2400 feet above sea level, but still warm. It can be hot at Jericho, the Dead Sea, and Masada at most times of the year. We will provide more information about the climate in our Helpful Hints for Travelers. There are about 12 1/2 hours of sunlight each day during the time of our tour. This gives plenty of time to see the country and make good photos. Even if you have been to Israel before, this is a great time to see the many changes that have taken place since your last visit. In my experience, it takes about three tours before one begins to fully understand the importance of the land in Biblical events. It is one thing to know that David met Goliath in the Elah Valley. It is another thing to understand why they met there. The vast majority of our tours in Israel, as well as other places, have been arranged and operated by Nawas International Travel. Nawas is a family owned and operated company with offices in the United States, Jerusalem, and other foreign cities. The company was established in 1949. Nawas never fails to provide what we need to make a tour the best possible experience for each traveler. The detailed brochure will be ready in a few weeks. We are now ready to receive deposit reservations from those who wish to join us for the tour, and we urge you not to wait if you want to join this tour. The complete brochure will include cancellation policies. There will be an administrative cancellation fee of $200 per person for any person cancelling at any time after making a deposit. Other graduated cancellation requirements begin 100 days prior to the departure date. These will be explained in the complete tour brochure. Make your deposit check payable to Ferrell Jenkins. Visit our Travel Blog. Over the past few years there have been entries on most of the sites we visit. Use the Search box to locate what you are interested in.